Andreas Trobollowitsch is a Vienna-based electroacoustic musician, composer and sound artist. He studied musicology and jazz theory in Vienna and Paris, and wrote his thesis about the spatial approach in the compositions of Stockhausen and Cage. Trobollowitsch works extensively in the fields of electroacoustic composition and improvisation, and has composed for dance, theatre, film and radio. In his works, he mainly uses modified fans, guitars, tapes and field recordings. Recently he has been focusing primarily on conceptual compositions, sound installations and self-developed musical instruments. He has released CDs and DVDs on schraum, Monotype, Filmarchiv Austria, cronica records, and has been awarded the State Scholarship for Composition, the Start Stipendium for music and performing arts, as well as numerous commissions and grants. He is one of the SHAPE artists performing at Novas Frequencias in Rio de Janeiro. Could you talk about Hecker, the performance you’re going to present at Novas Frequências festival in Rio de Janeiro? Hecker is a sound performance for three lumberjacks, six axes, and about 200 logs. During this twenty-minute performance, wood with different degrees of length and hardness will be chopped according to a musical score. The score contains specific instructions, such as when to use different kinds of axes on which kinds of wood. Also, the axes and the axe handles themselves are used as percussion instruments. Some parts of the score are well defined, while others have open structures, for example through the use of time brackets. In Hecker, the physical act of chopping is connected to the intellectual act of reading. The performance examines everyday rural life in terms of its sound quality. Why did you choose wood in particular? I grew up in the countryside, so wood has always been very present in my life. You studied musicology and jazz theory. What kind of background do you have? I studied at a conservatory in Vienna for a year. I left because I didn’t find what I was looking for. In the end, I graduated with a degree in musicology. But I would not consider that to be my background. I think that I was more influenced by the diverse musical projects that I have been part of, including metal bands, experimental pop, and so on. Your thesis focused on Stockhausen and Cage. Which aspects of their work do you find interesting in connection with your own practice? Towards the end of my musicology studies, I attended lectures on contemporary music, one of which was about John Cage. Ever since that moment, I’ve been interested in sound performance, and in the use of space in music. But at that time, I was primarily interested in the theoretical part. At that point, my studies were still a theoretical echo of what I’d already done, without really knowing that there were people around who did this sort of thing professionally. So at that time, their theories and concepts served more as a confirmation than an inspiration for my own practices. What specifically drew you to write about space and its importance in music? I wanted to explore the possibilities of two diametrically opposed composition concepts in terms of space: on the one hand, Stockhausen and serial music; on the other, Cage and aleatoric music. Whereas Stockhausen had an entire concert hall constructed according to his specific wishes, Cage mostly worked – or rather was forced to work – with pre-existing local conditions. He even used these conditions as creative elements. So these are two extreme examples. The relationship between music and space is extremely varied and never ending. Whenever I work on new performances, installations or compositions nowadays, I find it very important to consider spatiality in many different ways. This includes the positioning and the movement of the elements I use; the position of the audience; the light; the reverb; and so on. Your use of instruments includes trying to find ways to modify and adjust them; in other words, to break through them. Do you have a favourite technique that you invented? Yes, the modification of musical instruments and the use of so-called extended playing techniques has always been an important part of my work. But I’m also increasingly interested in modifying everyday objects. My “favourite technique” is based on a modified electric fan that uses the hair from a cello bow instead of propellers. I’ve used this element in various works and in different situations. 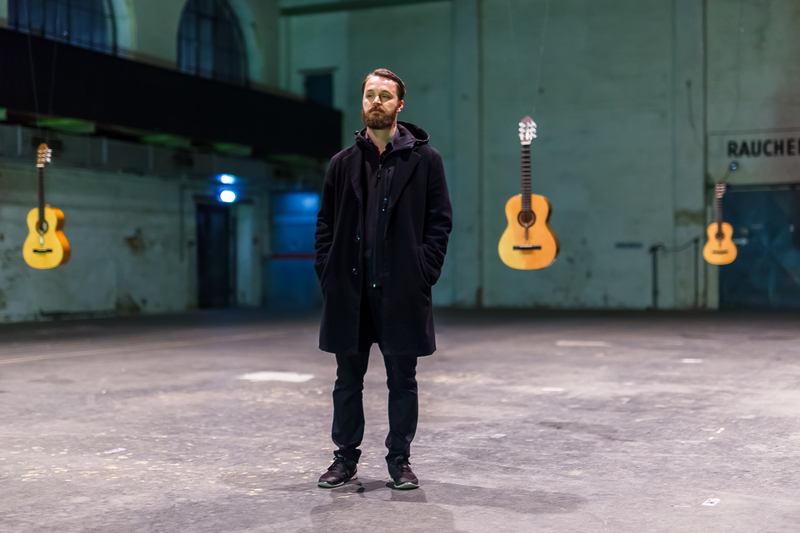 For example, the sound installation minigit featured four acoustic guitars hanging on a wall, and circling cello bow hair from electric fans made the strings oscillate. Due to the differing speeds of each fan, the soundscapes that arose changed permanently. These permanently modifying overtone layers wound up recalling an electronically-generated sound aesthetic. Based on this installation, I then made a sound performance called extract #1 for an electric fan, acoustic guitar, and single performer. In this work, it’s not the different speed of the fan that modulates the sound, but rather the performer’s position in relation to the fan: different strings are played according to the slow changes of an angle. The performer then uses their left hand to change pitch and tone by slightly turning the tuning pegs. This also allows the performer to modulate microtonal and micro-rhythmic elements. The combination of these two works resulted in my developing and constructing the “ventorgano,” an electro-acoustic synthesizer consisting of guitar strings, resonating bodies, and these prepared fans. But I would say that my favourite techniques are mainly based on rotation: for example, I also work with modified Walkmans. You have worked in various artistic fields such as radio, theatre, and film. How do you approach each of them? The first experimental audio work I made was actually a radio piece. There is a musical hall in Vienna that had burnt down, with a burnt piano in the middle of it. We went there and recorded the piano and the acoustics of the room and turned this into a radio feature. The music I’ve made for theatre, film, etc has been more random than intentional. I’ve received several requests to compose music for different projects. The most significant work in that sense was scoring video recordings from a 1920s video (together with David Schweighart) as part of a project that was released by Filmarchiv Austria. And what will you do after Rio? I will work as a co-curator and producer for a Brazilian artist-in-residence programme focused on performance and sound art. I’m also playing some concerts in São Paulo. Once I get back to Vienna, I will work on a vinyl release that includes minigit (the sound-installation I’ve already mentioned) and santa melodica, a spatial sound performance for prepared melodicas, balloons, cable tubes, and about seven interpreters. I will be a composer-in-residence in Lithuania, but I might do a small tour in Portugal first. I also want to work on a piece for piano and tractor later this year. So I guess we have once again arrived at this dichotomy of the refined and intellectual vs. the crude and rural. It’s not only a dichotomy of the intellectual and the crude; or, better yet, of the conceptual and the physical. There’s also the visual aspect, sonority, movement, and the way that they relate to sound. Last year, I did a residency in Buenos Aires where I worked on a piece for prepared electric fans, plants, chairs, human beings, and musical instruments. Recently, I’ve been working with different elements – such as performance, composition, or installation – all at the same time. What’s always important is the texture of things and their sound, as well as their juxtaposition. For example, if there’s a motor, a human being, and a plant, I try to treat these three elements in an equal way, so that they can all play an active role. So you work is like a “Gesamtkunstwerk”, encompassing various equally important artistic forms. Well, I actually don’t think in terms of these categories or methodologies. Over the course of time, certain elements that I’ve already used have grown together in a very natural way, becoming so much more complex and also interdisciplinary. My background is in music. Sound was always the most important thing to me, and I didn’t care about visuality much, but recently, I’ve been increasingly working in the context of visual arts. I would like to stay somewhere in the middle, because that’s where the most interesting things happen.